I knew when Amber wanted to go to this particular dance studio to dance with my niece and the rest of the girls that danced there, that I was making the commitment to get her to the university area every Tuesday. Not a huge sacrifice considering that we now get to eat dinner and spend time with my sister and her family, and my mother once a week. Alex gets to hang out with little Joe, and Tuesday has become his favorite day. Now that we are nearing our first competition, Tuesday has become Saturday, Monday, Tuesday....and whatever else may be necessary. At any other time in my life-so be it. My daughter loves what she is doing, and loves to be a part of a team, and all parents do these things for their kids. I have to say though it's rough at 9 months pregnant. A 2 hour rehearsal easily becomes a 3 1/2 our rehearsal with the drive. I'm old. I'm cranky. I'm tired. I don't want to pass this off on family or friends because I really want to enjoy this season of Amber's life with her, but there are definitely times that I would much rather lay down and take a nap. We are so excited for this performance on Saturday. I think Amber is going to do great! Her confidence on the stage is growing, and she is so happy to be a part of this team, which makes it all worth it. I am so proud of her. She is so beautiful. Yes she is beautiful!!! She has come such a long way since joining this group. Everyone should know that the rest of the girls have been dancing together for years and Amber had to come in and try out in order to be a part of this class. Miss Charyl saw something in her the first day and said she would do just fine. 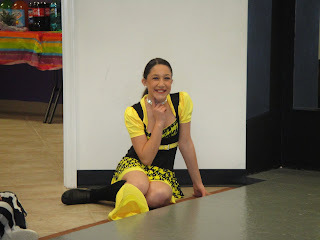 As her Aunt I have seen her self confidence grow leaps and bounds while she is dancing now. And I love that she and Danielle have something like this to share. Saturday is a big day for the girls - and lets hope another little girl from our family doesn't try to squeeze in, or should I say out, as they are on stage!!! I know Colleen doesn't want to miss this moment in Amber's life. She looks so gorgeous and so happy! Amber is doing a great job! I love seeing the girls dance together.